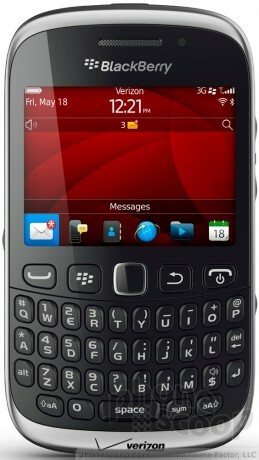 Verizon Wireless today added the Research In Motion BlackBerry Curve 9310 to its roster of BlackBerries. The 9310 is an entry-level smartphone that runs BlackBerry OS 7.1 and includes a 3.2-megapixel camera, full QWERTY keyboard with a dedicated BlackBerry Messenger button, GPS and navigation, parental controls, and support for microSD cards up to 32GB. The Curve 9310's display measures 2.44 inches and has 320 x 420 pixels. It supports 802.11b/g/n Wi-Fi and Bluetooth 2.1+EDR. The Curve 9310 will be available starting July 12, and will cost $49.99 after $50 mail-in rebate. The Curve requires customers to sign a two-year agreement and pick the Share Everything plan, which starts at $80 per month for unlimited voice and messaging, and 300MB of data. Research In Motion today added the BlackBerry Curve 9320 to its entry-level range of smartphones. It is a compact monoblock-style device with a full backlit QWERTY keyboard and a 2.44-inch non-touch display with 320 x 240 resolution. Boost Mobile today announced that it will offer the Blackberry Curve 9310 starting July 10 for $99.99. The 9310 is being paired with a plan that includes unlimited talk, text, and BlackBerry Messenger for $45 per month. Verizon business customers will soon have access to the newest BlackBerry, the Key2 LE. TCL Communication, which makes BlackBerry phones, announced today that the phone will launch in the "coming weeks" via business channels. Not 300MB... 40.00 is for Unlimited Talk Text and 300MB of data. What a rip off plan though..
"Share Everything plan, which starts at $80 per month for unlimited voice and messaging, and 300MB of data." Verizon is not known for being the cheapest on the block. They know those customers will go elsewhere if thats the only thing they are looking at. Stop to think. It's a BLACKBERRY. They're known for being data efficient. IMO, putting a cap on this is stupid, but the majority of people won't need more than 300 MB on a BlackBerry anyways. 80.00 will get you 6GB of data. Not sure where they got 300MB.. It looks to me like there transitioning 3g phones into the "basic" phone slot and 4G phones into the "more advanced" spot.